I love making play dough. There is something fun about developing this colorful toy by yourself, knowing that a child you love will have hours of play ahead of him. Making microwave play dough is by far the easiest way! The classic playdough recipe, cooked on the stove, works great but it takes a lot of elbow-grease stirring and stirring. So, when I came across a recipe for MICROWAVE play dough, I had to give it a try. Oh my goodness, is this so easy and the play dough turns out just as pliable and deeply colorful as ever. I won’t be making the old recipe again! *Bleached flour is whiter and gives you a truer color. **Neon food coloring is the most vivid. Use a microwave-safe mixing bowl. This process takes about 5 minutes including prep. Combine water, oil, food coloring and stir. Add cream of tartar, and stir again. Gradually add flour and stir as you go along to prevent lumps. A third time, 30 seconds. A fourth time, 30 seconds. It will now be in a ball. Wrap cooled play dough in plastic wrap and store at room temperature. *I spray the plate with cooking spray to make it easily removable from the plate. 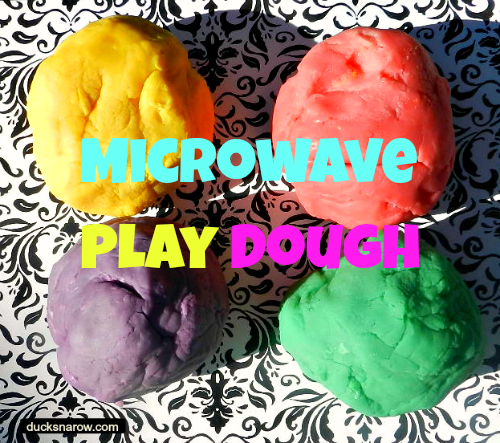 Making playdough is better than ever using the microwave. It is faster and easier, too. I love making play dough. There is something fun about developing this colorful toy by yourself, knowing that a child you love will have hours of play ahead of him. Note: This author is an Amazon affiliate. When I first began to teach preschool I was advised to be sure to include lots of play dough in my lesson plans. Best advice ever! With the right little tools– plastic cookie cutters, rolling pins, molds etc.- my little students have enjoyed hours of learning fun. Rather than buying it from a toy store, though, I would suggest that you make your own. It is so easy to do and you can make as much as you want! There are many homemade playdough recipes out there. I have tried a few and so far the one I like the best is the “classic” play dough recipe, using cream of tartar. I doubled this to make larger quantities of each color for my preschool class. Combine water, oil and food coloring. Keep adding drops of food coloring to get the shade you want. Expect it to look a bit lighter, soon as the flour is added. Add salt, cream of tartar and flour. Stir till it is smooth and the consistency of cake batter. Add the batter to a saucepan and heat on medium heat, stirring constantly. Eventually the thickening batter will pull away from the sides until it is in a lump. Scoop it out of the pan onto a plate to cool. When cool, store in a plastic container with lid or seal in a Ziploc bag. The play dough should stay fresh for up to 6 months of play. Tip 1: Spray your saucepan with cooking spray before heating. It helps prevent sticking. Tip 2: Spray the plate you will be cooling the play dough on with cooking spray, to prevent sticking. Play dough shapes made with cookie cutters.